In order to resubmit and renew JRA approval for the road closures, we need all residents who are benefitting from the road closure to fill out a copy of the form below. A little history on Glen Austin Estates. The gated community is now ten years old. The decision to apply was due to the fact that 2 murders took place in 2009. The community decided enough was enough after being terrorised by burglaries and hijackings on a weekly basis. A committee of 10 volunteers was formed, they started a section 21 company, (which is audited annually) and the long and expensive process of an application for an enclosure commenced, and the project was started to upgrade the security status of this gated area through the setting up of a road Closure in terms of The City of Johannesburg’s Security Access Restriction Policy. It took nearly two years to go through all the processes with the Johannesburg Road Agency, but it was successful with 87% of the residents signing for the closure which was approved on 5thAugust 2011. At this stage re-application has to be repeated every 2 years, although it may be changed to every 4 years. Other blocks in Glen Austin also tried for an enclosure, but Block 5 – later renamed Glen Austin Estates, was the only community that managed to get enough signatures and support to have their application approved. All open properties on the boundary of Allan Road and George Road had to be fenced. The West side was fenced by the Gautrain and the South by the Donovan Road properties. 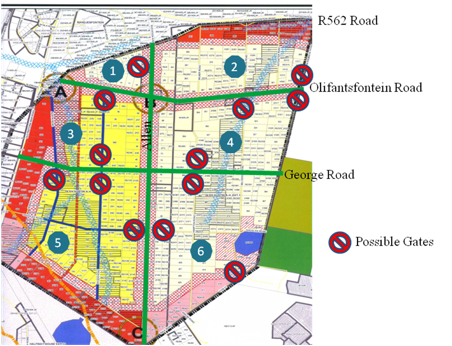 After a Road Traffic Study JRA decided one 24/7 entrance would be on Rosie’s Place Street and after an appeal by residents on the East side of the block, JRA decided to allow Douglas Road to have a gate which would be open at peak times 05:30 to 08:30 and 16:00 to 19:00 Monday to Friday and more recently also 13:00 to 14:30 during the Montessori school terms. The guard house on Rosie’s Place Street had to be completed at great expense after a community member who had started it, had financial difficulties and did not complete the project. The armed response company is TRSS Reaction (Pty) Ltd who won the tender to provide a designated vehicle in the Estate 24/7 and the guards. This arrangement is only viable while as many residents as possible continue to sign up for the services of TRSS – who offer 2 special packages for GAE residents – full armed response or Contributions to the Boom. At present GAE receives a rebate of R22 per month for every fully signed up property, which goes towards GAE security and maintenance funding. You can contact TRSS directly to either join up for armed response or to support the boom gate guarding on 011 708 1895, 086 111 4021 or 071 861 9092. In January 2014 a Resolution was passed that the R5000 Infrastructure Fee be paid each time a property changes hands., but this can, by arrangement, also be paid off in instalments or a monthly payment plan. This is due to the ongoing maintenance of the security equipment, including booms and cameras, gardens and the servicing of the guardhouse plus the stipulated present two yearly reapplication process. No monthly levies are charged. It is therefore only fair that everyone living or owning property within the Estate contributes. We also welcome any extra donations in this regard. 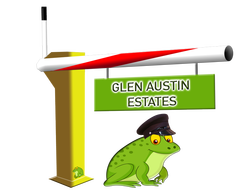 Glen Austin Estates is a gated community not a security complex where a developer has built the roads; therefore, the roads that are within the area are public roads. No pedestrian or vehicle can be denied access. The pedestrian gates have to be left open 24/7. However, TRSS patrol 24/7. We do urge residents not to be complacent, and to ensure their alarm systems are activated at night and when they are away from the premises and to ensure all gates, doors and windows are locked. Visible property numbers also help both the emergency and security services find the correct address when they are needed for urgent assistance. Should there be any security related problems please report immediately to block5.gatedcommunity@gmail.com and TRSS at reactionadmin@trss.co.za and on the GARA website. There is a 5 tonne limit on the roads and deliveries are permitted but residents are not allowed to keep vehicles of over 5 tonnes permanently on their property. Our roads are not built for such traffic. The Committee, manage the closure and continues to meet once a month and to send out regular updates. We always encourage residents to contact us with any comments or suggestions. 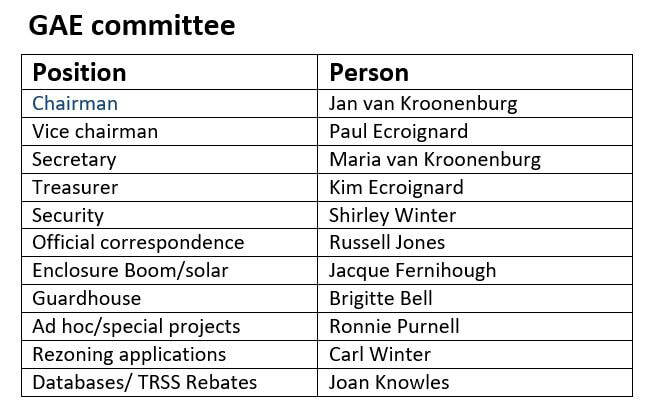 We also welcome those prepared to serve on the committee, but a reminder that the committee is made up of people who volunteer their time and skills to keep GAE a place where we want to live.